Bertin Bioreagent offers a large range of assay kits from ELISA to enzymatic activity kits, validated for their precision, accuracy and specificity. Bioreagent and bioanalytical tools are ready to use and contain all reagents, including quality controls. 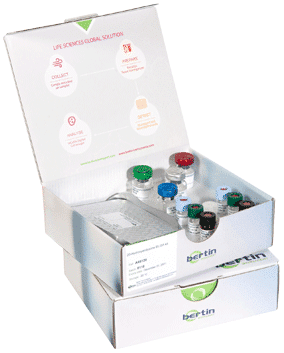 Bertin’s assay kits target biomarkers in research areas such as metabolic syndrome, pain, oxydative stress… To fit customer’s needs, Bertin Bioreagent’s kits can be customized for medium throughput screenings or for a new sample type. Bertin’s scientific team can also develop new assay kits for a new biomarker or multiplex several targets in a one kit.